"Vietcong" redirects here. For the video game, see Vietcong (video game). For the rock band, see Viet Cong (band). The flag of the Việt Cộng, adopted in 1960, is a variation on the flag of North Vietnam. The Việt Cộng (Vietnamese: [vîət kə̂wŋmˀ] ( listen)), also known as the National Liberation Front, was a mass political organization in South Vietnam and Cambodia with its own army – the People's Liberation Armed Forces of South Vietnam (PLAF) – that fought against the United States and South Vietnamese governments during the Vietnam War, eventually emerging on the winning side. It had both guerrilla and regular army units, as well as a network of cadres who organized peasants in the territory it controlled. Many soldiers were recruited in South Vietnam, but others were attached to the People's Army of Vietnam (PAVN), the regular North Vietnamese army. During the war, communists and anti-war activists insisted the Việt Cộng was an insurgency indigenous to the South, while the U.S. and South Vietnamese governments portrayed the group as a tool of Hanoi. Although the terminology distinguishes northerners from the southerners, communist forces were under a single command structure set up in 1958. The headquarters of the Viet Cong based at Memot came to be known as Central Office for South Vietnam or COSVN by its Military Assistance Command, Vietnam (MACV) and South Vietnamese counterparts, a near-mythical "bamboo Pentagon" from which the Việt Cộng's entire war effort was being directed. For nearly a decade the fabled COSVN headquarters, which directed the entire war effort of the Viet Cong was the target of the RVN/US war effort, and which would have collapsed the insurgency war effort. US and South Vietnamese Special Forces sent to capture them usually were killed very quickly or returned with heavy casualties to the point that teams refused to go. Daily B-52 bombings had failed to kill any of the leadership during Operation Menu despite flattening the entire area, as Soviet trawlers were able to forewarn COSVN, whom used the data on speed, altitude and direction to move perpendicular and to move underground. North Vietnam established the National Liberation Front on December 20, 1960, to foment insurgency in the South. Many of the Việt Cộng's core members were volunteer "regroupees", southern Việt Minh who had resettled in the North after the Geneva Accord (1954). Hanoi gave the regroupees military training and sent them back to the South along the Hồ Chí Minh trail in the early 1960s. The NLF called for southern Vietnamese to "overthrow the camouflaged colonial regime of the American imperialists" and to make "efforts toward the peaceful unification". The PLAF's best-known action was the Tết Offensive, a gigantic assault on more than 100 South Vietnamese urban centers in 1968, including an attack on the U.S. embassy in Saigon. The offensive riveted the attention of the world's media for weeks, but also overextended the Việt Cộng. Two further offensives were conducted in its wake, the mini-Tet and August Offensive. In 1969 the Việt Cộng would establish the Provisional Revolutionary Government of the Republic of South Vietnam, a shadow-country in South Vietnam intended to represent the organisation on the world stage and was immediately recognised by the communist bloc and maintained diplomatic links with many nations in the Non-Aligned Movement. Later communist offensives were conducted predominantly by newly mechanised PAVN forces, as the ability of the Việt Cộng to recruit among the South Vietnamese became much more limited. The Việt Cộng remained an active military and political front. The organisation was dissolved in 1976 when North and South Vietnam were officially unified under a communist government. Political and military organization of the Việt Cộng was complex, with a series of well-constructed, overlapping networks, committees and organisations; see strategy, organization and structure. Material aid was primarily provided through the well-established, ingenious Hồ Chí Minh trail, which withstood the most sustained bombing campaign in history while expanding the war effort; see logistics and equipment. They had further developed a complex insurgency warfare method capable of countering overwhelmingly superior numbers and technology, retaining the strategic initiative during much of the war. 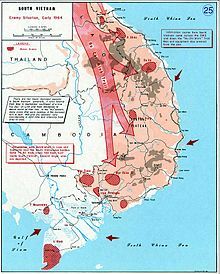 According to the Pentagon Papers, 90% of large firefights were initiated by the PAVN/VC and 80% were well-planned VC operations throughout most of the war and as early as 1966 US Secretary of Defense Robert McNamara expressed doubt about the US ability to win the war (see NLF and PAVN battle tactics). The term Việt Cộng appeared in Saigon newspapers beginning in 1956. It is a contraction of Việt Nam Cộng-sản (Vietnamese communist), or alternatively Việt gian cộng sản ("Communist Traitor to Vietnam"). The earliest citation for Việt Cộng in English is from 1957. Media worldwide referred to them as "Vietcong". American soldiers referred to them as Victor Charlie or V-C. "Victor" and "Charlie" are both letters in the NATO phonetic alphabet. "Charlie" referred to communist forces in general, both Việt Cộng and North Vietnamese. The official Vietnamese history gives the group's name as the Liberation Army of South Vietnam or the National Liberation Front for South Vietnam (NLFSV; Mặt trận Dân tộc Giải phóng miền Nam Việt Nam). [nb 1] Many writers shorten this to National Liberation Front (NLF). [nb 2] In 1969, the Việt Cộng created the "Provisional Revolutionary Government of the Republic of South Vietnam" (Chính Phủ Cách Mạng Lâm Thời Cộng Hòa Miền Nam Việt Nam), abbreviated PRG. [nb 3] Although the NLF was not officially abolished until 1977, the Việt Cộng no longer used the name after PRG was created. Members generally referred to the Việt Cộng as "the Front" (Mặt trận). Today's Vietnamese media most frequently refers to the group as the "People's Liberation Armed Forces of South Vietnam (PLAF)" (Quân Giải phóng Miền Nam Việt Nam). By the terms of the Geneva Accord (1954), which ended the Indochina War, France and the Việt Minh agreed to a truce and to a separation of forces. The Việt Minh had become the government of Democratic Republic of Vietnam since the Vietnamese 1946 general election, and military forces of the communists regrouped there. Military forces of the non-communists regrouped in South Vietnam, which became a separate state. Elections on reunification were scheduled for July 1956. A divided Vietnam angered Vietnamese nationalists, but it made the country less of a threat to China. The Democratic Republic of Vietnam in the past and Vietnam in the present did not and do not recognize the division of Vietnam into two countries. Chinese Premier Zhou Enlai negotiated the terms of the ceasefire with France and then imposed them on the Việt Minh. 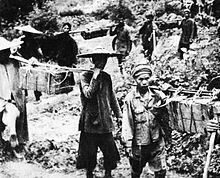 About 90,000 Việt Minh were evacuated to the North while 5,000 to 10,000 cadre remained in the South, most of them with orders to refocus on political activity and agitation. The Saigon-Cholon Peace Committee, the first Việt Cộng front, was founded in 1954 to provide leadership for this group. Other front names used by the Việt Cộng in the 1950s implied that members were fighting for religious causes, for example, "Executive Committee of the Fatherland Front", which suggested affiliation with the Hòa Hảo sect, or "Vietnam-Cambodia Buddhist Association". Front groups were favored by the Việt Cộng to such an extent that its real leadership remained shadowy until long after the war was over, prompting the expression "the faceless Việt Cộng". Led by Ngô Đình Diệm, South Vietnam refused to sign the Geneva Accord. Arguing that a free election was impossible under the conditions that existed in communist-held territory, Diệm announced in July 1955 that the scheduled election on reunification would not be held. After subduing the Bình Xuyên organized crime gang in the Battle for Saigon in 1955, and the Hòa Hảo and other militant religious sects in early 1956, Diệm turned his attention to the Việt Cộng. Within a few months, the Việt Cộng had been driven into remote swamps. The success of this campaign inspired U.S. President Dwight Eisenhower to dub Diệm the "miracle man" when he visited the U.S. in May 1957. France withdrew its last soldiers from Vietnam in April 1956. In March 1956, southern communist leader Lê Duẩn presented a plan to revive the insurgency entitled "The Road to the South" to the other members of the Politburo in Hanoi. He argued adamantly that war with the United States was necessary to achieve unification. But as China and the Soviets both opposed confrontation at this time, Lê Duẩn's plan was rejected and communists in the South were ordered to limit themselves to economic struggle. Leadership divided into a "North first", or pro-Beijing, faction led by Trường Chinh, and a "South first" faction led by Lê Duẩn. As the Sino-Soviet split widened in the following months, Hanoi began to play the two communist giants off against each other. The North Vietnamese leadership approved tentative measures to revive the southern insurgency in December 1956. Lê Duẩn's blueprint for revolution in the South was approved in principle, but implementation was conditional on winning international support and on modernizing the army, which was expected to take at least until 1959. President Hồ Chí Minh stressed that violence was still a last resort. Nguyễn Hữu Xuyên was assigned military command in the South, replacing Lê Duẩn, who was appointed North Vietnam's acting party boss. This represented a loss of power for Hồ, who preferred the more moderate Võ Nguyên Giáp, who was defense minister. This 23-year-old man, who had defected from the Communist forces and joined the South Vietnam Government side, was recaptured by the Việt Cộng and spent a month in a Việt Cộng internment camp, 1966. An assassination campaign, referred to as "extermination of traitors"  or "armed propaganda" in communist literature, began in April 1957. Tales of sensational murder and mayhem soon crowded the headlines. Seventeen civilians were killed by machine gun fire at a bar in Châu Đốc in July and in September a district chief was killed with his entire family on a main highway in broad daylight. In October 1957, a series of bombs exploded in Saigon and left 13 Americans wounded. In a speech given on September 2, 1957, Hồ reiterated the "North first" line of economic struggle. The launch of Sputnik in October boosted Soviet confidence and led to a reassessment of policy regarding Indochina, long treated as a Chinese sphere of influence. In November, Hồ traveled to Moscow with Lê Duẩn and gained approval for a more militant line. In early 1958, Lê Duẩn met with the leaders of "Inter-zone V" (northern South Vietnam) and ordered the establishment of patrols and safe areas to provide logistical support for activity in the Mekong Delta and in urban areas. In June 1958, the Việt Cộng created a command structure for the eastern Mekong Delta. French scholar Bernard Fall published an influential article in July 1958 which analyzed the pattern of rising violence and concluded that a new war had begun. The North Vietnamese Communist Party approved a "people's war" on the South at a session in January 1959 and this decision was confirmed by the Politburo in March. In May 1959, Group 559 was established to maintain and upgrade the Ho Chi Minh trail, at this time a six-month mountain trek through Laos. About 500 of the "regroupees" of 1954 were sent south on the trail during its first year of operation. The first arms delivery via the trail, a few dozen rifles, was completed in August 1959. Brinks Hotel, Saigon, following a Việt Cộng bombing on Dec. 24, 1964. Two American officers were killed. Two regional command centers were merged to create the Central Office for South Vietnam (Trung ương Cục miền Nam), a unified communist party headquarters for the South. COSVN was initially located in Tây Ninh Province near the Cambodian border. On July 8, the Việt Cộng killed two U.S. military advisors at Biên Hòa, the first American dead of the Vietnam War. [nb 4] The "2d Liberation Battalion" ambushed two companies of South Vietnamese soldiers in September 1959, the first large unit military action of the war. This was considered the beginning of the "armed struggle" in communist accounts. A series of uprisings beginning in the Mekong Delta province of Bến Tre in January 1960 created "liberated zones", models of Việt Cộng-style government. Propagandists celebrated their creation of battalions of "long-hair troops" (women). The fiery declarations of 1959 were followed by a lull while Hanoi focused on events in Laos (1960–61). Moscow favored reducing international tensions in 1960, as it was election year for the U.S. presidency. [nb 5] Despite this, 1960 was a year of unrest in South Vietnam, with pro-democracy demonstrations inspired by the South Korean student uprising that year and a failed military coup in November. Deputy Commander-in-Chief of the People's Liberation Armed Forces Lê Đức Anh. To counter the accusation that North Vietnam was violating the Geneva Accord, the independence of the Việt Cộng was stressed in communist propaganda. The Việt Cộng created the National Liberation Front of South Vietnam in December 1960 at Tân Lập village in Tây Ninh as a "united front", or political branch intended to encourage the participation of non-communists. The group's formation was announced by Radio Hanoi and its ten-point manifesto called for, "overthrow the disguised colonial regime of the imperialists and the dictatorial administration, and to form a national and democratic coalition administration." Thọ, a lawyer and the NLF's "neutralist" chairman, was an isolated figure among cadres and soldiers. South Vietnam's Law 10/59, approved in May 1959, authorized the death penalty for crimes "against the security of the state" and featured prominently in Việt Cộng propaganda. Violence between the Việt Cộng and government forces soon increased drastically from 180 clashes in January 1960 to 545 clashes in September. By 1960, the Sino-Soviet split was a public rivalry, making China more supportive of Hanoi's war effort. For Chinese leader Mao Zedong, aid to North Vietnam was a way to enhance his "anti-imperialist" credentials for both domestic and international audiences. About 40,000 communist soldiers infiltrated the South in 1961–63. The Việt Cộng grew rapidly; an estimated 300,000 members were enrolled in "liberation associations" (affiliated groups) by early 1962. The ratio of Việt Cộng to government soldiers jumped from 1:10 in 1961 to 1:5 a year later. 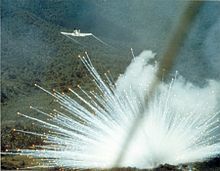 U.S. Air Force Douglas A-1E Skyraider drops a white phosphorus bomb on a Việt Cộng position in South Vietnam in 1966. The level of violence in the South jumped dramatically in the fall of 1961, from 50 guerrilla attacks in September to 150 in October. U.S. President John F. Kennedy decided in November 1961 to substantially increase American military aid to South Vietnam. The USS Core arrived in Saigon with 35 helicopters in December 1961. By mid-1962, there were 12,000 U.S. military advisors in Vietnam. The "special war" and "strategic hamlets" policies allowed Saigon to push back in 1962, but in 1963 the Việt Cộng regained the military initiative. The Việt Cộng won its first military victory against South Vietnamese forces at Ấp Bắc in January 1963. A Viet Cong soldier poses inside a captured M48 tank. A landmark party meeting was held in December 1963, shortly after a military coup in Saigon in which Diệm was assassinated. North Vietnamese leaders debated the issue of "quick victory" vs "protracted war" (guerrilla warfare). After this meeting, the communist side geared up for a maximum military effort and PAVN troop strength increased from 174,000 at the end of 1963 to 300,000 in 1964. The Soviets cut aid in 1964 as an expression of annoyance with Hanoi's ties to China. [nb 6] Even as Hanoi embraced China's international line, it continued to follow the Soviet model of reliance on technical specialists and bureaucratic management, as opposed to mass mobilization. The winter of 1964–1965 was a high-water mark for the Việt Cộng, with the Saigon government on the verge of collapse. Soviet aid soared following a visit to Hanoi by Soviet Premier Alexei Kosygin in February 1965. Hanoi was soon receiving up-to-date surface-to-air missiles. The U.S. would have 200,000 soldiers in South Vietnam by the end of the year. In January 1966, Australian troops uncovered a tunnel complex which had been used by COSVN. Six thousand documents were captured, revealing the inner workings of the Việt Cộng. As a result of an agreement with the Cambodian government made in 1966, weapons for the Việt Cộng were shipped to the Cambodian port of Sihanoukville and then trucked to Việt Cộng bases near the border along the "Sihanouk Trail", which replaced the Ho Chi Minh Trail. Many People's Liberation Armed Forces of South Vietnam (PLAF) units operated at night, and employed terror as a standard tactic. Rice procured at gunpoint sustained the Việt Cộng. Squads were assigned monthly assassination quotas. Government employees, especially village and district heads, were the most common targets. But there were a wide variety of targets, including clinics and medical personnel. Notable Việt Cộng atrocities include the massacre of over 3,000 unarmed civilians at Huế, 48 killed in the bombing of My Canh floating restaurant in Saigon in June 1965 and a massacre of 252 Montagnards in the village of Đắk Sơn in December 1967 using flamethrowers. Việt Cộng death squads assassinated at least 37,000 civilians in South Vietnam; the real figure was far higher since the data mostly cover 1967-72. They also waged a mass murder campaign against civilian hamlets and refugee camps; in the peak war years, nearly a third of all civilian deaths were the result of Việt Cộng atrocities. Ami Pedahzur has written that "the overall volume and lethality of Vietcong terrorism rivals or exceeds all but a handful of terrorist campaigns waged over the last third of the twentieth century". People's Liberation Armed Forces Sapper Units are sworn in before the General Offensive, General Uprising, Tet Offensive. Major reversals in 1966 and 1967, as well as the growing American presence in Vietnam, inspired Hanoi to consult its allies and reassess strategy in April 1967. While Beijing urged a fight to the finish, Moscow suggested a negotiated settlement. Convinced that 1968 could be the last chance for decisive victory, General Nguyễn Chí Thanh, suggested an all-out offensive against urban centers. [nb 7] He submitted a plan to Hanoi in May 1967. After Thanh's death in July, Giáp was assigned to implement this plan, now known as the Tet Offensive. The Parrot's Beak, an area in Cambodia only 30 miles from Saigon, was prepared as a base of operations. Funeral processions were used to smuggle weapons into Saigon. Việt Cộng entered the cities concealed among civilians returning home for Tết. The U.S. and South Vietnamese expected that an announced seven-day truce would be observed during Vietnam's main holiday. A U.S. propaganda leaflet urges Việt Cộng to defect using the Chiêu Hồi Program. At this point, there were about 500,000 U.S. troops in Vietnam, as well as 900,000 allied forces. General William Westmoreland, the U.S. commander, received reports of heavy troop movements and understood that an offensive was being planned, but his attention was focused on Khe Sanh, a remote U.S. base near the DMZ. In January and February 1968, some 80,000 Việt Cộng struck more than 100 towns with orders to "crack the sky" and "shake the Earth." The offensive included a commando raid on the U.S. Embassy in Saigon and a massacre at Huế of about 3,500 residents. House-to-house fighting between Việt Cộng and South Vietnamese Rangers left much of Cholon, a section of Saigon, in ruins. The Việt Cộng used any available tactic to demoralize and intimidate the population, including the assassination of South Vietnamese commanders. A photo by Eddie Adams showing the summary execution of a Việt Cộng in Saigon on February 1 became a symbol of the brutality of the war. In an influential broadcast on February 27, newsman Walter Cronkite stated that the war was a "stalemate" and could be ended only by negotiation. Two more offensives occurred later that year, known as the "Mini-Tet" Offensives. The offensive was undertaken in the hope of triggering a general uprising, but urban Vietnamese did not respond as the Việt Cộng anticipated. About 75,000 communist soldiers were killed or wounded across all three phases ending in August, according to Trần Văn Trà, commander of the "B-2" district , which consisted of southern South Vietnam. "We did not base ourselves on scientific calculation or a careful weighing of all factors, but...on an illusion based on our subjective desires", Trà concluded. Earle G. Wheeler, chairman of the Joint Chiefs of Staff, claimed that Tet resulted in 40,000 communist dead (compared to about 10,600 U.S. and South Vietnamese dead). "It is a major irony of the Vietnam War that our propaganda transformed this debacle into a brilliant victory. The truth was that Tet cost us half our forces. Our losses were so immense that we were unable to replace them with new recruits", said PRG Justice Minister Trương Như Tảng. Tet had a profound psychological impact because South Vietnamese cities were otherwise safe areas during the war. U.S. President Lyndon Johnson and Westmoreland argued that panicky news coverage gave the public the unfair perception that America had been defeated. The Tet Offensive according to deputy commander Nguyễn Thị Định had set the Viet Cong back but did not destroy their power base. Aside from some districts in the Mekong Delta, the Việt Cộng failed to spurn popular uprising and create a governing apparatus in South Vietnam following Tet, according to an assessment of captured documents by the U.S. CIA. However the breakup of larger Việt Cộng units increased the effectiveness of the CIA's Phoenix Program (1967–72), which targeted individual leaders although was known to often create civilian casualties. Further defections increased under the Chiêu Hồi Program following the failure of a General Uprising. Alongside defections, the expansion of voluntary Regional Force and Popular Force and expansion of the ARVN draft had deprived the Viet Cong of recruitment sources. Confining US forces to guarding bases, and an end to the destructive search and destroy had decreased motivations to join the VC and the effect of the South Vietnamese pacification program and programs such as the Land to the Tiller program had decreased some of the initial unpopularity of the RVN. By the end of 1969, there was little communist-held territory, or "liberated zones", in South Vietnam, according to the official communist military history. There were no predominantly southern units left and 70 percent of communist troops in the South were northerners. Following the Tet Offensive Lê Duẩn and Hoàng Văn Thái whom represented the "Southern faction" favoring quick and decisive campaigns lost to Trường Chinh and Võ Nguyên Giáp, representives of the "Northern First" faction whom favoured a strategy of continual protracted, guerrilla warfare favouring the previously effective quick-attack and quick-withdrawals that worn down US forces while mechanising and modernising the PAVN. The PAVN would later became field-tested at Operation Lam Son 719 and the Easter Offensive. The prominent role of the Viet Cong would be increasingly sidelined by the more able PAVN. 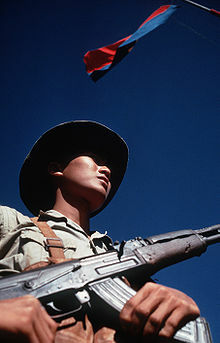 Việt Cộng soldier stands beneath a Việt Cộng flag carrying his AK-47 rifle. The Tet Offensive increased public discontent with American participation in the Vietnam War and led the U.S. to gradually withdraw combat forces and to shift responsibility to the South Vietnamese, a process called Vietnamization. Pushed into Cambodia, the Việt Cộng could no longer draw South Vietnamese recruits. In May 1968, Trường Chinh urged "protracted war" in a speech that was published prominently in the official media, so the fortunes of his "North first" fraction may have revived at this time. COSVN rejected this view as "lacking resolution and absolute determination." The Soviet invasion of Czechoslovakia in August 1968 led to intense Sino-Soviet tension and to the withdrawal of Chinese forces from North Vietnam. The formation of the Provisional Revolutionary Government of the Republic of South Vietnam however did see the Viet Cong leadership, as a front government of the Viet Cong, take a more prominent and pro-active international role. Beginning in February 1970, Lê Duẩn's prominence in the official media increased, suggesting that he was again top leader and had regained the upper hand in his longstanding rivalry with Trường Chinh. After the overthrow of Prince Sihanouk in March 1970, the Việt Cộng faced a hostile Cambodian government which authorized a U.S. offensive against its bases in April. However, the capture of the Plain of Jars and other territory in Laos, as well as five provinces in northeastern Cambodia, allowed the North Vietnamese to reopen the Ho Chi Minh trail. Although 1970 was a much better year for the Việt Cộng than 1969, it would never again be more than an adjunct to the PAVN. The 1972 Easter Offensive was a direct North Vietnamese attack across the DMZ between North and South. Despite the Paris Peace Accords, signed by all parties in January 1973, fighting continued. In March, Trà was recalled to Hanoi for a series of meetings to hammer out a plan for an enormous offense against Saigon. Việt Cộng soldiers carry an injured American POW to a prisoner swap in 1973. The VC uniform was a floppy jungle hat, rubber sandals, and green fatigues without rank or insignia. For the full article, see Fall of Saigon. In response to the anti-war movement, the U.S. Congress passed the Case–Church Amendment to prohibit further U.S. military intervention in Vietnam in June 1973 and reduced aid to South Vietnam in August 1974. With U.S. bombing ended, communist logistical preparations could be accelerated. An oil pipeline was built from North Vietnam to Việt Cộng headquarters in Lộc Ninh, about 75 miles northwest of Saigon. (COSVN was moved back to South Vietnam following the Easter Offensive.) The Ho Chi Minh Trail, beginning as a series of treacherous mountain tracks at the start of the war, was upgraded throughout the war, first into a road network driveable by trucks in the dry season, and finally, into paved, all-weather roads that could be used year-round, even during the monsoon. Between the beginning of 1974 and April 1975, with now-excellent roads and no fear of air interdiction, the communists delivered nearly 365,000 tons of war matériel to battlefields, 2.6 times the total for the previous 13 years. The success of the 1973–74 dry season offensive convinced Hanoi to accelerate its timetable. When there was no U.S. response to a successful communist attack on Phước Bình in January 1975, South Vietnamese morale collapsed. The next major battle, at Buôn Ma Thuột in March, was a communist walkover. After the fall of Saigon on April 30, 1975, the PRG moved into government offices there. At the victory parade, Tạng noticed that the units formerly dominated by southerners were missing, replaced by northerners years earlier. The bureaucracy of the Republic of Vietnam was uprooted and authority over the South was assigned to the PAVN. People considered tainted by association with the former South Vietnamese government were sent to reeducation camps, despite the protests of the non-communist PRG members including Tạng. Without consulting the PRG, North Vietnamese leaders decided to rapidly dissolve the PRG at a party meeting in August 1975. North and South were merged as the Socialist Republic of Vietnam in July 1976 and the PRG was dissolved. The NLF was merged with the Vietnamese Fatherland Front in February 1977. The alleged 1966 martyrdom of Việt Cộng soldier Nguyễn Văn Bé is much celebrated in Vietnam, despite the fact that he later turned up alive. Activists opposing American involvement in Vietnam said that the Việt Cộng was a nationalist insurgency indigenous to the South. They claimed that the Việt Cộng was composed of several parties—the People's Revolutionary Party, the Democratic Party and the Radical Socialist Party—and that NLF Chairman Nguyễn Hữu Thọ was not a communist. Anti-communists countered that the Việt Cộng was merely a front for Hanoi. They said some statements issued by communist leaders in the 1980s and 1990s suggested that southern communist forces were influenced by Hanoi. According to the memoirs of Trần Văn Trà, the Việt Cộng's top commander and PRG defense minister, he followed orders issued by the "Military Commission of the Party Central Committee" in Hanoi, which in turn implemented resolutions of the Politburo. [nb 8] Trà himself was deputy chief of staff for the PAVN before being assigned to the South. The official Vietnamese history of the war states that "The Liberation Army of South Vietnam [Việt Cộng] is a part of the People's Army of Vietnam". People's Army of Vietnam, the North Vietnamese army. ^ Radio Hanoi called it the "National Front for the Liberation of South Vietnam" in a January 1961 broadcast announcing the group's formation. In his memoirs, Võ Nguyên Giáp called the group the "South Vietnam National Liberation Front" ( Nguyên Giáp Võ, Russell Stetler (1970). The Military Art of People's War: Selected Writings of General Vo Nguyen Giap. pp. 206, 208, 210. ). See also the "Program of the National Liberation Front of South Viet-Nam". Archived from the original on 2010-06-26. (1967). ^ The terminology "liberation front" is adapted from the earlier Greek and Algerian National Liberation Fronts. ^ This also follows terminology used earlier by leftists in Greece (Provisional Democratic Government) and Algeria (Provisional Government of the Algerian Republic). ^ Major Dale R. Buis and Master Sergeant Charles Ovnand, the first names to appear on the Vietnam Veterans Memorial. ^ There was also a U.S. presidential election in 1964. ^ Disappointed with the results of the 1964 U.S. presidential election, the Kremlin did not try to influence the election of 1968. Desiring "businesslike" relations, the Kremlin favored incumbent Richard Nixon against left-wing challenger George McGovern in 1972. (Lynn-Jones, p. 29). 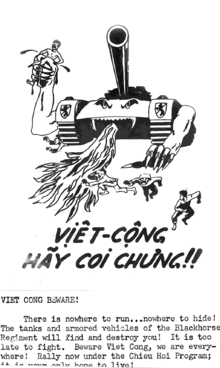 ^ "National Liberation Front (Viet Cong)". ^ a b Burchett, Wilfred (1963): "Liberation Front: Formation of the NLF", The Furtive War, International Publishers, New York. ^ Possibly a pseudonym for Trần Văn Trà. "Man in the News: Lt.-Gen. Tran Van Tra". February 2, 1973. Archived from the original on August 23, 2009. ^ Bolt, Dr. Ernest. 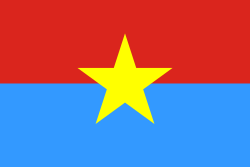 "Provisional Revolutionary Government of South Vietnam (1969–1975)". University of Richmond. ^ a b c Military History Institute of Vietnam,(2002) Victory in Vietnam: The Official History of the People's Army of Vietnam, 1954–1975, translated by Merle L. Pribbenow. University Press of Kansas. p. 68. ISBN 0-7006-1175-4. ^ a b c Gibson, James William (2007-12-01). The Perfect War: Technowar in Vietnam. Grove/Atlantic, Inc. pp. 400–402. ISBN 9780802196811. ^ "The Strategist Behind the Vietcong; North Vietnam's Commander in Chief breaks all the rules of conventional warfare. And for 20 years he has been confounding conventionally trained opponente". August 16, 1964. Retrieved June 19, 2018. ^ Currey, Cecil B. (2005). Victory at Any Cost: The Genius of Viet Nam's Gen. Võ Nguyên Giáp. Potomac Books, Inc. p. 500. ISBN 9781612340104. ^ "McNamara stuck to Vietnam War despite doubts". Christian Science Monitor. 2009-07-06. ISSN 0882-7729. Retrieved 2018-06-19. ^ Prados, John (2009). Vietnam: The History of an Unwinnable War, 1945–1975. University Press of Kansas. ISBN 9780700619405. ^ a b c d e f g h i j k l m n o p "Origins of the Insurgency in South Vietnam, 1954–1960". The Pentagon Papers. 1971. pp. 242–314. ^ William S. Turley (2009). The second Indochina War: a concise political and military history. Rowman & Littlefield. pp. xiv. ISBN 978-0-7425-5526-6. ^ "The Sydney Morning Herald - Google News Archive Search". news.google.com. Retrieved 2018-12-06. ^ See, for example, this story in Viet Nam News, the official English-language newspaper. ^ a b Karnow, p. 245. ^ a b c "The History Place — Vietnam War 1945–1960". Retrieved 2008-06-11. ^ a b Ang, Cheng Guan (2002). The Vietnam War from the Other Side. RoutledgeCurzon. p. 16. ISBN 0-7007-1615-7. ^ Olson, James; Randy Roberts (1991). "Where the Domino Fell: America and Vietnam, 1945–1990". New York: St. Martin's Press: 67. This decision was made at the 11th Plenary Session of the Lao Động Central Committee. ^ Võ Nguyên Giáp. The Political and Military Line of Our Party. The Military Art. pp. 179–80. ^ McNamera, Robert S.; Blight, James G.; Brigham, Robert K. (1999). Argument Without End. PublicAffairs. p. 35. ISBN 1-891620-22-3. ^ a b Ang, p. 24-25. ^ Victory in Vietnam, p. xi. ^ Prados, John, (2006) "The Road South: The Ho Chi Minh Trail", Rolling Thunder in a Gentle Land, editor By Andrew A. Wiest, Osprey Publishing, ISBN 1-84603-020-X. ^ Gettleman, Marvin E.; Jane Franklin; Marilyn Young (1995). Vietnam and America. Grove Press. p. 187. ISBN 0-8021-3362-2. ^ Kelly, Francis John (1989) . History of Special Forces in Vietnam, 1961–1971. Washington, D.C.: United States Army Center of Military History. p. 4. CMH Pub 90-23. ^ Nghia M. Vo Saigon: A History 2011 - Page 140 "... on December 19 to 20, 1960, Nguyễn Hữu Thọ, a Saigon lawyer, Trương Như Tảng, chief comptroller of a bank, Drs. Dương Quỳnh Hoa and Phùng Văn Cung, along with other dissidents, met with communists to form the National Liberation Front..."
^ Zhai, Qiang (2000). China and the Vietnam Wars, 1950–1975. p. 83. ISBN 0-8078-4842-5. ^ a b Victory in Vietnam, p. xii. ^ Pribbenow, Merle (August 1999). "North Vietnam's Master Plan". Vietnam. ^ a b Ang, p. 74-75. ^ a b Zhai, p. 128. ^ Victory in Vietnam, p. xiii. ^ a b Karnow, p. 427. ^ a b "1957–1975: The Vietnam War". libcom. ^ "VC Tunnels". Digger History. ^ Zumbro, Ralph (1986). Tank Sergeant. Presidio Press. pp. 27–28, 115. ISBN 978-0-517-07201-1. The Viet Cong were commonly referred to by the Vietnamese rural population as "night bandits" or the "night government". ^ U.S. Senate Judiciary Committee, The Human Cost of Communism in Vietnam (1972), p.49. ^ U.S. Senate Judiciary Committee, The Human Cost of Communism in Vietnam (1972), p. 8. ^ "The My Canh Restaurant bombing". ^ Krohn, Charles, A., The Last Battalion: Controversies and Casualties of the Battle of Hue. pg. 30. Westport 1993. "On the Other Side: Terror as Policy". Time. December 5, 1969. "The Massacre of Dak Son". Time. December 15, 1967. Pictures of Dak Son can be viewed here. ^ Guenter Lewy, America in Vietnam, (Oxford University Press, 1978), pp272-3, 448-9. ^ Pedahzur, Ami (2006), Root Causes of Suicide Terrorism: The Globalization of Martyrdom, Taylor & Francis, p.116. ^ a b Ang, pp. 116–117. ^ Westmoreland, p. 344 (editor's note). ^ "The Massacre of Hue". Time. October 31, 1969. Pike, Douglas. "Viet Cong Strategy of Terror". pp. 23–39. ^ Kearny, Cresson H. (Maj) (1997). "Jungle Snafus...and Remedies". Oregon Institute of Science and Medicine: 327. ^ Lee, Nathan (April 10, 2009). "A Dark Glimpse From Eddie Adams's Camera". New York Times. ^ Tran Van Tra. "Tet". in Warner, Jayne S. Warner (1993). Luu Doan Huynh (eds.). The Vietnam War: Vietnamese and American Perspectives. Armonk NY: M.E. Sharpe. pp. 49–50. CS1 maint: Uses editors parameter (link) A map of the military districts can be found here. ^ Tran Van Tra. "Comments on Tet '68". ^ a b "Vietnam Veterans for Academic Reform". Archived from the original on 2009-02-26. ^ Crowell, Todd Crowell (October 29, 2006). "The Tet Offensive and Iraq". Archived from the original on August 23, 2009. ^ Aron, Paul (2005-11-07). Mysteries in History. p. 404. ISBN 1-85109-899-2. ^ "Vietnam: A Television History; Interview with Nguyen Thi Dinh, 1981". openvault.wgbh.org. Retrieved 2018-06-15. ^ a b Whitcomb, Col Darrel (Summer 2003). "Victory in Vietnam: The Official History of the People's Army of Vietnam, 1954–1975 (book review)". Air & Space Power Journal. Archived from the original on 2009-02-07. ^ a b c Porter, Gareth (1993). Vietnam: The Politics of Bureaucratic Socialism. p. 26. ISBN 978-0-8014-2168-6. ^ a b c Currey, Cecil B. (2005). Victory at Any Cost: The Genius of Viet Nam's Gen. Vo Nguyen Giap. Potomac Books, Inc. pp. 272–274. ISBN 9781574887426. ^ a b Ang, p. 52. ^ Tran Van Tra. "Vietnam: History of the Bulwark B2 Theatre". Archived from the original on 2009-05-28. ^ Friedman, SGM Herbert A. "The Strange Case of the Vietnamese 'Late Hero' Nguyen Van Be". ^ Karnow, Stanley (1991). Vietnam: A history. Penguin Books. ISBN 0-670-84218-4. , p. 255. ^ Bolt, Dr. Ernest. "Who is Tran Van Tra?". Archived from the original on 2011-07-10. Retrieved 2009-04-07. U.S. Senate Judiciary Committee, The Human Cost of Communism in Vietnam (1972), part I, part II, part III, and part IV. Marvin Gettleman, et al. Vietnam and America: A Documented History. Grove Press. 1995. ISBN 0-8021-3362-2. See especially Part VII: The Decisive Year. Truong Nhu Tang. A Việt Cộng Memoir. Random House. ISBN 0-394-74309-1. 1985. See Chapter 7 on the forming of the Việt Cộng, and Chapter 21 on the communist take-over in 1975. Frances Fitzgerald. Fire in the Lake: The Vietnamese and the Americans in Vietnam. Boston: Little, Brown and Company, 1972. ISBN 0-316-28423-8. See Chapter 4. "The National Liberation Front". Douglas Valentine. The Phoenix Program. New York: William Morrow and Company. 1990. ISBN 0-688-09130-X. Wikimedia Commons has media related to Vietcong. Tet Offensive 1968, US Embassy & Saigon fighting. CBS News footage of the Tet Offensive. Vietnam War – Hue Massacre 1968. A tribute to the dead of Huế by Trịnh Công Sơn, one of wartime Vietnam's most prominent composers. The Wars for Vietnam: 1945–1975. Primary documents concerning the Vietnam War, including peace proposals, treaties, and platforms. Digger History, VC Tunnels. At one point, Việt Cộng tunnels stretched from the Cambodia border to Saigon. The Viet Cong 1965–1967 – part 1 and The Viet Cong 1965–1967 – part 2. What was it like to be a Việt Cộng? This recruiting video shows one perspective. "Tiên vê Sài Gòn" (Forward to Saigon.) This propaganda video features singing Việt Cộng and newsreel footage from the 1975 offensive.